The gist of the story is this: Frankenstein’s monster (Aaron Eckhart) is drawn into the ongoing war between the legions of hell and the Gargoyle Order (yes, gargoyles, like the carvings on old churches. They’re sort of like junior angels). There’s more to it, but not a whole lot. The demons, led by Prince Naberius (Bill Nighy), are trying to rediscover Victor Frankenstein’s method for reanimating corpses – for a sinister reason, of course. The leader of the Gargoyle Order, Queen Leonore (Miranda Otto), tries to recruit Frankenstein’s monster to help her dwindling forces, but he’s on nobody’s side but his own. It’s an utterly ridiculous premise, but makes for seriously awesome special effects. The demons look like regular people until they decide to look like demons – then their skin burns away and you see their demonic head instead. The gargoyles look a lot like grotesques – big bat-like wings, animalistic features, etc. – except when they want to look human. They can snap between the two instantly, which gives them some very interesting capabilities in battle. When a demon’s body is killed with a sanctified weapon, their spirit becomes a streaking fireball which descends back into hell, where they are then trapped. When a gargoyle is killed (which can only be done by a being with no soul), their spirit becomes a beam of light and ascends up to heaven. The special effects are generally very good, if ridiculous (the machine Terra and her fellow scientists use for reanimation looks utterly absurd, and there’s a huge corpse storage facility which is lifted pretty much straight from the “Matrix” movies). The actors are all serious about their roles, which is a little disappointing. Movies like this are bit more fun when the actors really sink their teeth into the scenery. The one exception is Bill Nighy, who seems to have a delight in playing the antagonists of cheesy monster movies. Eckhart, who is an incredibly skilled actor, gets little more to do than fight, deliver awkward expository voiceovers, and wear scar makeup. 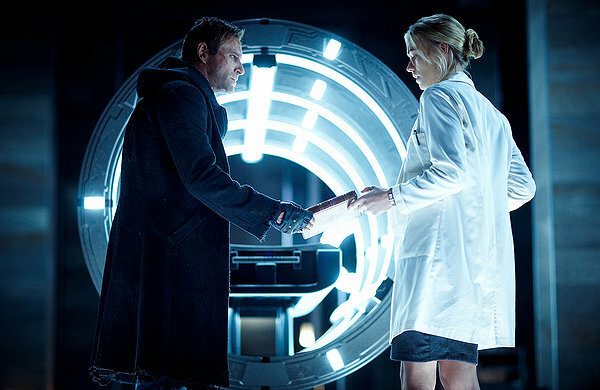 If you like the “Underworld” movies, you’ll probably like “I, Frankenstein.” They have similar styles – both emphasize form over function, going all out on the visuals while barely bothering to flesh out a real (or even coherent) plot. The characters are basically costume holders and fight choreography performers, with very little in the way of development or motivation (for example, Leonore’s right hand man gives no indication of why he’s her most trusted soldier; he questions, yells at, and outright disobeys her throughout the film). In short, if you just want to veg out in front of some pretty pictures of monsters fighting, “I, Frankenstein” will handle it for you. If, on the other hand, you want to see a movie that’s thought-provoking, coherent, and full of fully-developed and well-crafted characters, go elsewhere.